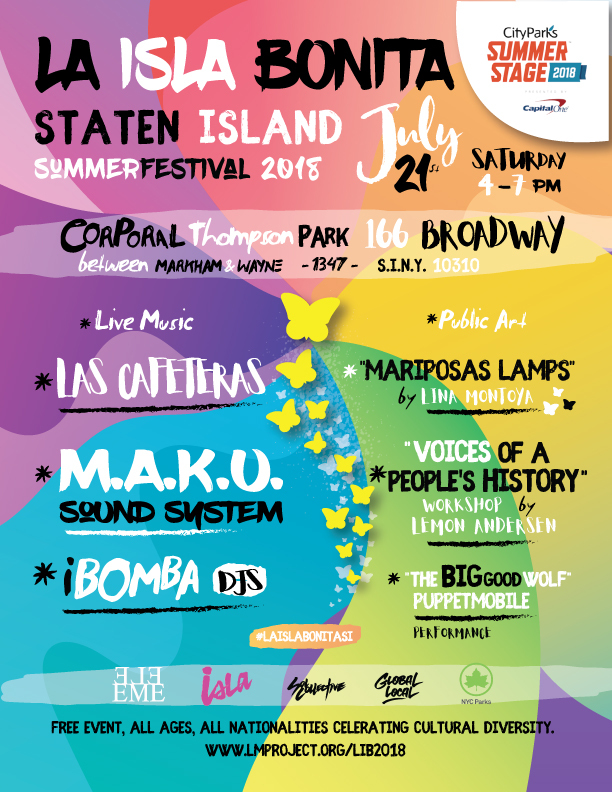 In association with La Isla Bonita Summer Festival, Las Cafeteras, M.A.K.U. SoundSystem, and iBomba (DJ Ushka & DJ Beto) will guide audiences on a rhythmic journey ranging from beat music to future dancehall, breaking down borders. Throughout the festival our Staten Island Love Letter station will provide a space to express your love, pride, concerns and hopes for Staten Island and add it to a borough map. DIRECTIONS: Corporal Thompson Park is bordered by Broadway Ave, Henderson Ave, and Chapell Street, and is accessible by the S46, S96, S40, and S44 buses.